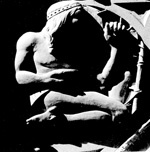 Relief sculpture of an American Indian on Sledd Hall on the campus of the University of Florida. Scanned. No deterioration. Digitized with funding from the <a href="http://www.imls.gov">Institute of Museum and Library Services</a> as part of the Ephemeral Cities grant project. Photograph 4270 from the University Archives Photograph Collection.